"Ken Coleman has a gift of asking the questions we should all be asking. One Question gets to the heart of the most important issues in our lives and taps into the wisdom of some today's most admired achievers." "Ken Coleman has delivered a game-changing challenge with One Question. The answers to our biggest questions are readily available if we have the courage to ask them. This book will help you get the answers you need." 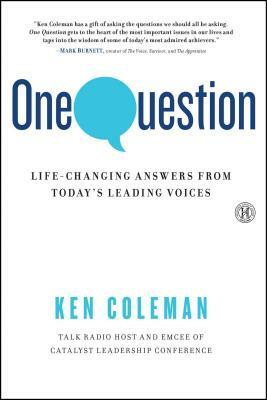 "Ken Coleman allows us to eavesdrop on his insightful questions with many of the brightest and most respected minds in our world. One Question is a delightful, inspiring mandate to never stop asking."